Dark of the Moon could be on track to repeat the franchise's Razzie success. Michael Bay's third - and thankfully final - Transformers movie, Dark of the Moon, could make a strong showing in the 2011 Golden Raspberry nomination list. The Golden Raspberry awards, better known as the Razzies, are a parody of the Oscars, and award the worst movies of the year. 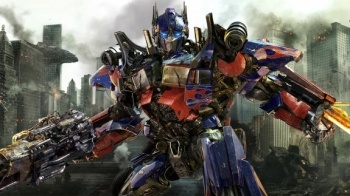 The Transformers movies are no stranger to the Razzies; Revenge of the Fallen "won" the Worst Picture, Worst Director and Worse Screenplay categories in last year's ceremony, as well as being nominated for four more. Razzie founder John Wilson said that while Dark of the Moon hasn't received reviews as bad as Revenge of the Fallen, it was still in with a very good chance. "It has all of the earmarks to be a big contender again," he said. "It's still got a low score at Rotten Tomatoes and it's a blatant rip-off of the first two films." Fortunately for Michael Bay and everyone else involved with the movie, Hollywood has produces plenty of stinkers this year, and it might have to fight for its nominations. "All of the big-budget blockbusters in 2011 have been horrible at best," he said. In any other year, Green Lantern would be a shoo-in for a nomination, but now I just don't know -- there's so much competition!" It's a little distressing - not to mention depressing - that a movie as bad as Green Lantern might not clean up at the Razzies. It really does speak to how bad some of Hollywood's output has been this year. Hopefully, the rest of the year will be better.